This is our 1/2 oz. Copper Gator Weedless Spoon with Black Skirt Trailer. This is a 7 oz. White Powder Coat Gator Casting Spoon. This spoon features a 7/0 VMC J hook, # 9 split rings and a 2/0 swivel. The length is 6 1/4" long excluding the hook and 1 9/16 at widest point. This is our 1/2 oz. Chrome Gator Weedless Spoon with Pink Skirt Trailer. This is our 3 oz. Silver Gator Casting Spoon with Emerald tape. These spoons feature a 3/0 VMC treble hook, stainless split rings and a swivel. The length is 4 1/4" long excluding the hook. 1/2 oz. Chrome Gator Weedless Spoon - Red Skirt Trailer. This is our 1/2 oz. Chrome Gator Weedless Spoon with Red Skirt Trailer. 1/4 oz. Gold Gator Weedless Spoon - Silver Sparkle Worm Trailer. This is our 1/4 oz. Gold Gator Weedless Spoon with Silver Sparkle Worm Trailer. This is our 3 oz. Silver Gator Casting Spoon with Red tape. These spoons feature a 3/0 VMC treble hook, stainless split rings and a swivel. The length is 4 1/4" long excluding the hook. 1/2 oz. 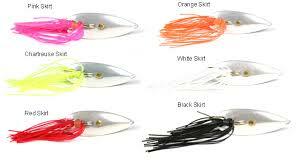 Chrome Gator Weedless Spoon - White Skirt Trailer. This is our 1/2 oz. Chrome Gator Weedless Spoon with White Skirt Trailer. 1/2 oz. 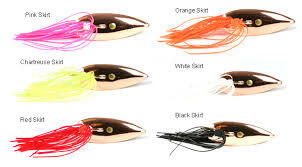 Copper Gator Weedless Spoon - White Skirt Trailer. This is our 1/2 oz. Copper Gator Weedless Spoon with White Skirt Trailer. 1/2 oz. 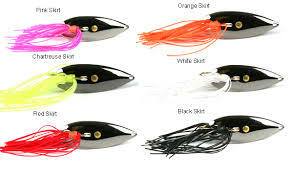 Black Gator Weedless Spoon - White Skirt Trailer. This is our 1/2 oz. Black Gator Weedless Spoon with White Skirt Trailer. 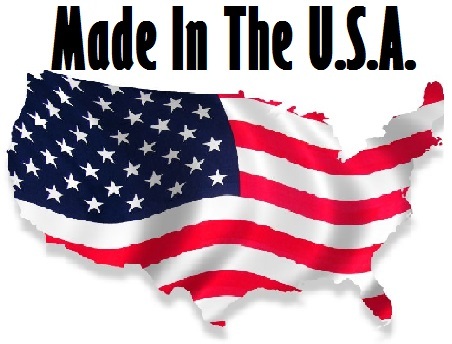 This is our 1/4 oz. Chrome Gator Weedless Spoon with Red Skirt Trailer. 100 Silver Gator Kingspoon™ - Chartreuse Tape.